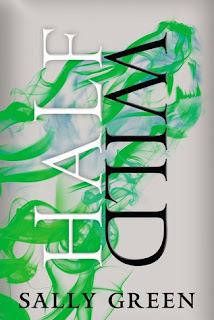 Hey, have you read Half Bad yet? If not, then you probably should stop reading this post and read this one first! Half Wild picks up not long after Half Bad ends off, with Nathan reckoning with his new gifts and a brief encounter with his famous father. Nathan's gift is that same as his father's--the ability to turn into a beast. His inability to control his gift add to his conflicting feelings about his own identity as White or Black Witch, especially as Nathan and Gabriel are caught up in a rebel movement to fight the corrupt White Witches. The story takes them all over Europe, from allies to enemies, and culminating in a devastating betrayal. I'm not going to lie, you guys. Me reading this book as mostly just shipping Gabriel and Nathan. And then tweeting about my feelings. Because even though we don't know what happens to Gabriel at the end of Half Bad, of course he's fine. OF COURSE. Because Sally Green can't kill off Gabriel any more than she can write a convincingly romantic scene between Nathan and Annalise, who, by the way, is the worst. And that's not a spoiler, it's just a fact. The book is full of action, and lots of moving around and emotional angst. Nathan still hasn't really figured himself out in this book, and is still working off of questionable personal motives and allowing himself to be manipulated by people who might be good, might be bad, we can't be sure. Because the characters are constantly moving around and their goals change a lot, the story doesn't feel quite as tight as the first book, but the tension between Nathan and Gabriel more than make up for it all. And along the way, we meet up with some favorite characters from the first book and learn some more about Nathan's parents' past. Book purchased from my indie.